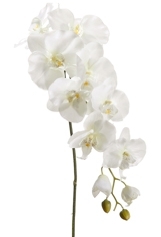 6 pcs of Natural Touch Phalaenopsis Orchid Spray Stems w/9 Flowers & 3 Buds in a Natural Off White Tone. 44.5" Tall. Place them in a vase and you will have an instant beautiful arrangement! Use them to decorate your ceremony or reception and keep them forever... You can also make your own bouquets, centerpieces, mix them with real flowers or fillers and nobody will be able to tell!